A freezer is a stand alone appliance which operates at only one temperature, below freezing point, from minus 5 degrees Centigrade to minus 25 degrees Centigrade. Fresh produce like fish, meat and the like can be stored for a month and may be more. They use three types of evaporators that wraps around the side walls to do the cooling, they are the plate type, the shelf type, and the forced-air type. Plate and shelf type - the evaporator coils of this type are stamped into the walls of the inner aluminum casing in a plate or shelf form, they came in one piece, and has a housing of it own. No fan is being use on them, since they are mounted into the side walls of the box. distribute the air on the sides of the compartment. 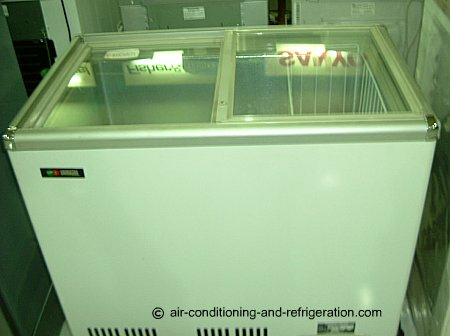 This type of unit has an automatic defrost system, where the thawed water is drained to the bottom of a base pan where it is heated by the discharge coils from the compressor, and cooling the refrigerant going into the evaporator. compressor to achieve very low temperature, minus 12 degrees Centigrade. To reach the set temperature, the unit has to run for at least two hours. To cool the compressor and prevents it from over heating, one or two cooling fans are used depending on the model. Refrigerant gas from theEvaporator enters the compressor and it is being compressed at high speed, the high pressure gas refrigerant enters the condenser unit, and heat is being dissipated into the atmosphere; and the gas refrigerant condensates, and turns into liquid refrigerant. It passes through a filter/dryer where moisture, small iron particles, and dirts are removed from the system, and it enters the expansion valve. The volume of the liquid refrigerant is being controlled, and the pressure reduced, it enters the evaporator in mist form. Then the heat inside the chamber is being absorbed and the refrigerant boils and turns into gas. The gas refrigerant flows to the compressor where the whole cycle repeats itself again.